With nothing more than an iPhone, you can capture a moving story with the power to become a historical treasure. You do not need expensive professional gear. But, choosing the right camcorders, lights and accessories will make your job as a Reel Historian™ much easier and more successful. If you don’t already own some equipment, set aside time to do some basic research and learn what features to look for when making your purchase. We have put together the essential information you need to know to get you started. Lots of attention gets focused on the visual side of recording a video biography. But, good audio is even more vital to creating a satisfying video. The key to success is NOT to use the microphone on your camera to record voices. Your camera microphone will be too far from your subject to record a strong signal. Microphones can’t zoom in, so what they do is amplify everything when the incoming sound is too low. This increases the noises in the room as well. In fact, the loudest sounds will be those closest to the camera (and its built-in microphone) which is usually you. Clip the mike onto your interview subject’s lapel, tuck the wire behind their clothes to hide it from view, and plug it into the camera’s audio input jack. Your interview subject’s voice will be loud, clear, and distinct. Since the mike is close to the sound source, background noise is minimized. If you already read through the section on getting good audio, then you may have picked up on the most critical feature for any camera that you buy – an external microphone input jack! The world of video cameras has exploded in recent years. Practically every new phone and tablet can record HD video. Most digital still cameras can too. And then there are hundreds of other options on the market from el cheapo units to camcorders costing thousands of dollars. 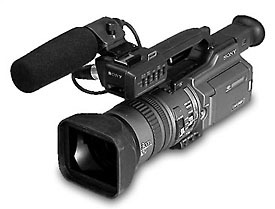 If the camera has an external audio jack you can make it work. If you plan on recording video biographies professionally, plan on investing a few thousand dollars in a high-quality DSLR camera with video capabilities or a dedicated pro-level camcorder. If all you can afford is the camera you’ve got, get close to your subject (for clearest audio from the built-in mike) and add some light to ensure the camera produces the best image possible. The existing lights in most interior spaces is not sufficiently bright for good results. Shoot outside if you have to. This section will be expanded in the near future, but the short answer to success in lighting is ‘Soft Light’. A large white paper lantern with a bright bulb inside produces a very attractive light that makes people look good. Get a couple lanterns with high wattage CFL bulbs (daylight color lights are recommended) and place them close to the interview subject – one on each side just out of the camera’s view. The daylight colored bulbs will blend well with any window light coming in and avoid those weird color problems where the window light looks blue and the inside lights look orange. The lanterns ‘spread out the light’ which helps to soften shadows and minimize skin imperfections. The trickiest part of working with lanterns is hanging them in place. But, the results are worth the effort. If you are willing to invest a little money into a Softbox Lighting Kit, you will get that same great looking light and the lights will be much easier to setup and control. A proper lighting kit is an essential investment if you plan to record video biographies as a business.